HRH Princess Anne wore this coat at the investiture of her brother, the Prince of Wales on 1 July 1969 at Caernarfon Castle, Gwynedd, north Wales. 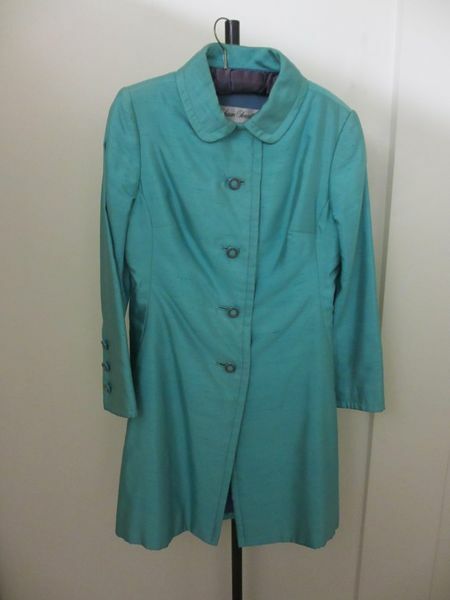 It was worn with a matching toque hat designed by John Boyd. While her mother, Queen Elizabeth II, went to couturiers such as Norman Hartnell or Hardy Amies. Anne went to the ready-to-wear firm Susan Small. 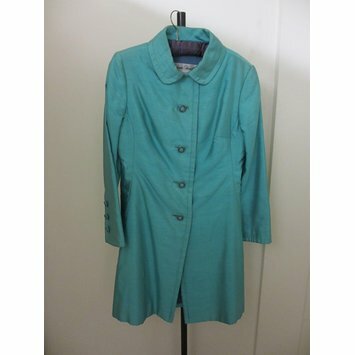 This coat was designed for her by Maureen Baker, the company's head designer since 1943. Classic tailoring was updated with a fashionable mini length for the then nineteen year old Princess. Susan Small was a British ready-to-wear firm, founded in the early 1940s by Leslie Carr Jones. In the 1970s it was bought by Courtaulds, the large textile manufacturers. Baker started her own company 'Maureen Baker Designs' in 1978, following Susan Small's closure. Mini-length redingote in turquoise slubbed silk with half belt. Four silver-metal and plastic buttons fastening front, three on each cuff. This turquoise redingote was designed for Princess Anne to wear at the investiture of the Prince of Wales on 1 July 1969 at Caernarvon Castle. It was worn with a matching toque hat. Historical significance: Worn by Princess Anne at the investiture of the Prince of Wales on 1 July 1969 at Caernarvon Castle. Susan Small was a British ready-to-wear firm, founded in the early 1940s by Leslie Carr Jones. In the 1970s it was bought by Courtaulds, the textile giant. Maureen Baker joined the firm as chief designer in 1943. She created Princess Anne's wedding dress in 1973. Baker started her own company 'Maureen Baker Designs' in 1978, following Susan Small's closure. Attribution note: Made for Princess Anne for a Royal engagement, although not from a couture house.